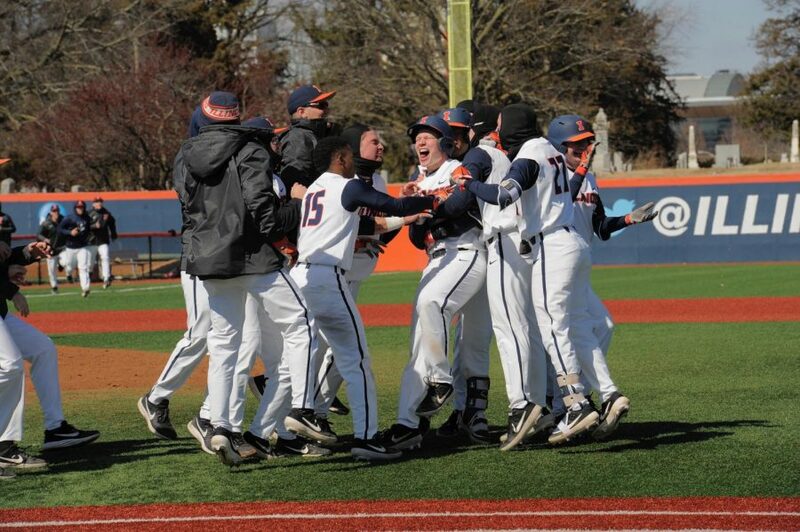 The Illini celebrate their 3-0 victory over Southern Illinois at Illinois Field on Sunday. The team's current 13-3 record is the best 16-game season start since 1989. 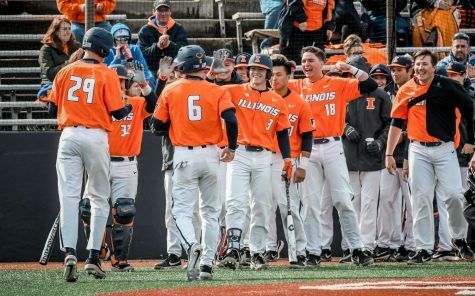 Illinois won its fifth home opener in a row and its fourth sweep in five weeks thanks to a 3-0 weekend over Southern Illinois this weekend. 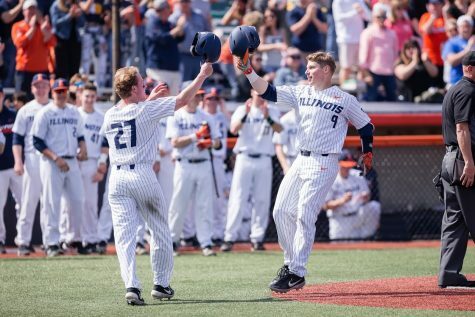 The three wins over the Salukis pushed the Illini’s season record to 13-3 — their best 16-game start to a season since 1989 — and improved their all-time record against SIU to 41-39. The Illini are currently sitting atop the Big Ten standings, tied with the Wolverines at 13-3. 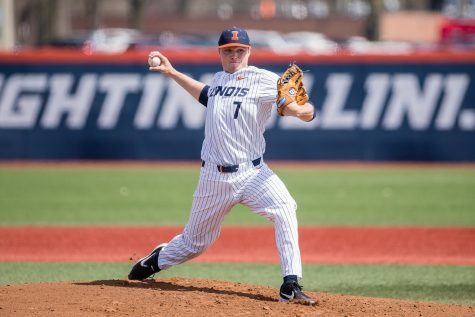 Illinois clinched a pair of 5-4 wins over SIU Saturday during its doubleheader at Illinois Field. 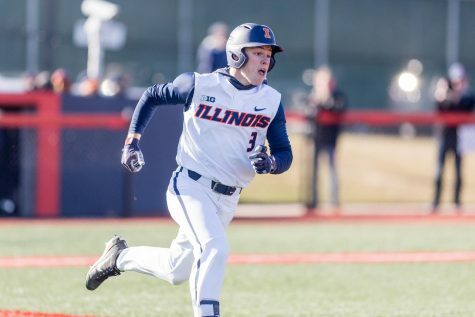 In the first game, freshman catcher Jacob Campbell knocked a walk-off sac fly that brought two runners home during the eighth inning, securing the win for Illinois. Freshman infield utility Kellen Sarver led the Illini’s bats in game one after going 3-for-4 with one run. Junior Michael Massey also homered for his third straight game. 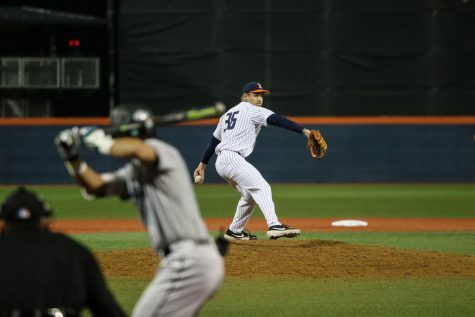 In the second game, Illinois jumped in front of the SIU 3-0 until the seventh inning, when the Salukis registered four unearned runs in the seventh. 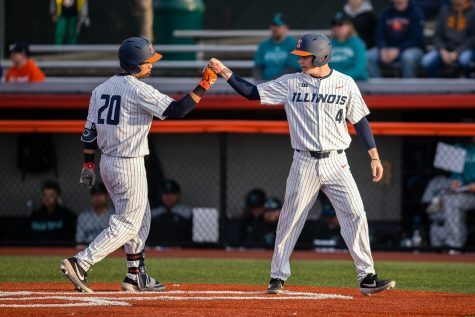 Senior outfielder Jack Yalowitz clocked a double in the eight, tying the game and allowing the Illini to edge the Salukis with two more runs. Freshman utility Cam McDonald’s bat was on fire during game two. He led the Illini with two runs and one RBI after going 3-for-4 in the contest. 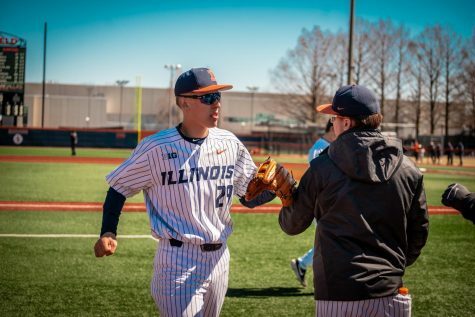 During the matchups against SIU, Illinois depended highly on pitching, as the trio of Ty Weber, Cyrillo Watson and Andy Fisher allowed just five earned runs all weekend. 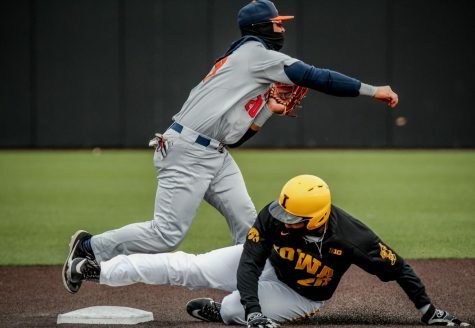 After winning the first two games in close fashion, 5-4 and 5-4, respectively, Illinois put the game away early on Sunday, exploding for a season-high 14 runs and 18 hits, one less than their season high 19 against Florida Atlantic in February. Massey continued his impressive season, adding five more hits and another homer to his season numbers which sit at .317 batting average, .391 on-base percentage and .517 slugging percentage with three doubles and three home runs. Although four-hit days from Massey and junior Ben Troike and a homer from Kellen Sarver dominated the game, Cyrillo Watson’s six strong innings were not to be ignored as he gave up just two earned runs and left the game with a 10-run lead before the trio of Josh Harris, Caleb Larson and Ryan Schmitt closed things out. Next up, Illinois will take a six-game win streak to face St. Louis University on Tuesday for a two-game series. The current streak matches the Illini’s highest of the season when they opened the season 6-0. There are just five games left before conference play starts against Iowa on March 29.